God is Exalted (Isaiah 6) Lesson #6 in What is God Like? When you think about what you want your children to learn at church, what’s the first thing that pops into your mind? We’ve all been there. With so much truth in the Bible where do we start? Why not start where the Bible starts. No, not necessarily creation, but GOD. Who is God? What is God like? What does God do? Through this series of 42 lessons we’ll be introducing children to fullness of God’s character one attribute at a time. Most churched children will tell you that God created the world, or He rescues His people, or even that Jesus came to earth to rescue God’s people, but the goal of these lessons is for them to begin to know more of who He is and what it means to worship Him for who He is. This is lesson 6 of 42. This series is currently in-progress and will have new lessons each week, visit Bethany’s author page to see the latest available. Ask one of the kids in the group to remind you what you’re learning this year. Remind them that each week we’ll be looking into the Bible to answer the question… “Can you tell me what God is like?” and will be learning one of the many truths about God that we see in His Word. Ask if anyone can remember the truths we’ve learned so far. Have the kids stand up and say the attributes of God and do the motions. Explain that you’re going to play a review game to see how well your remember the truths we’re learned about God. You should read the following verses one at a time and have the kids call out which truth about God it tells us about. (If you don’t think you have time to go through all of the verses, just choose a few). 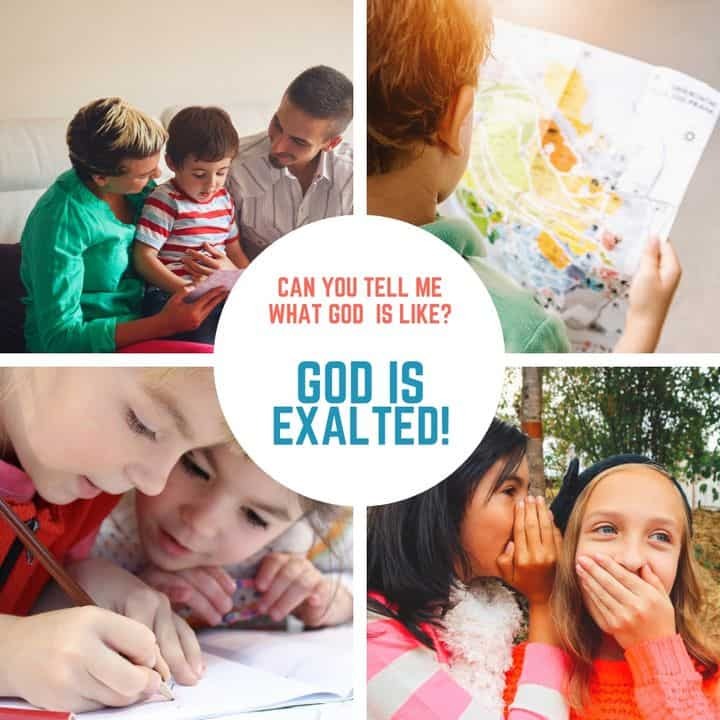 Get started by showing kids the page that says “God is Exalted” and ask if any of the kids in the group know what that word means, or if anyone has any guesses what it might mean. Read the key verse for the week (Psalm 46:10). Discuss as a group what the world exalts (what we make much of/ what we spend our time doing/ thinking about, what we spend our money on, what motivates us- beauty, wealth, health, nice homes, new toys, celebrity, etc.) Then, read the verse (Psalm 46:10) one more time and ask the question – where is God exalted? Briefly explain that the truth we see throughout the Bible is that God is exalted (high/ above) in all the earth and He alone deserves that place of honor. Explain that sin is when we exalt ourselves or our desires over God. Then, read the text for the week, Isaiah 6:1-13 to the kids. After reading make these points. Isaiah was sad because a good and wise king had died and he must have been wondering what would happen next. Isaiah has a vision of God/ the Lord sitting on a throne (high & exalted). Why was it important that he saw God sitting on His throne? Isaiah had forgotten that even though the earthly king was dead that the King of Kings (God) was still reigning. This was a reminder to God’s people that they didn’t need a king like the other nations, because their KING was reigning forever from heaven. When Isaiah saw God and heard the seraphs singing of His holiness, he responded in fear because “no one can see the Lord and live. “ (Exodus 33:20). a seraph touched Isaiah’s lips with a coal from the altar and said his sins were atoned for…. ASK: who can atone (pay for) sin? only Jesus. God asked who would go for Him and Isaiah responded- send me. Isaiah knew that God is sovereign and in control of all and immediately following in obedience. verses 9-13 are the instructions Isaiah was given and what he was to say to the people – basically, God told Isaiah to go and preach to a people who wouldn’t respond and to keep preaching until everyone and everything was destroyed; but Isaiah’s job was to go and preach. To help the kids remember this truth about God, take a few minutes to define the attribute. EXPLAIN: Ask….. how did we see God exalted in this story? Talk about how in the passage in Isaiah, God was lifted up on His throne and we need to remember that when we say God is exalted we are saying He is above everyone and everything. He is the highest and the most important. Since motions & actions help kids remember, choose an action for EXALTED. A good motion might be to jump or reach as high as you can. SAY: “This week’s memory verse is Psalm 46:10. This verse reminds us that God is exalted above all things.” Remind the kids of the discussion earlier about what we exalt more that God. Give kids a minute of silence to think about or confess silently what they exalt more that God and close by praying a prayer of confession of your own confessing what you put above God. Read the memory verse (Psalm 46:10) a few times together and do the motion for exalted. In our story this morning, we were reminded that God is the high and exalted King. He’s the one who reigns over all and the one who is worthy of all our praise. Think for a minute about that description of God and then listen to this description of Jesus from Philippians 2:5-11 (read the passage). The Bible tells us that although was high and exalted, because of our sin and because of His love for His people, He left His throne and made Himself nothing. He became a servant and lived a perfect life and died the death that we deserve for our sin. Remember that sin is when we put ourselves or our desires in the place reserved for God alone and exalt ourselves. Because we exalt ourselves, Jesus humbled Himself and died in our place. Verse 9 says… therefore….because He humbled Himself, God exalted Him again to His rightful place so that at His name every knees will bow and every tongue confess that He is Lord. That’s the picture of worship that we see in Revelation 5:9-10 (read the verses) – Jesus is worthy because He purchased men from all nations with His blood. Give each child a blank piece of paper provide markers or colored pencils. Encourage them to write the word exalted somewhere on the paper and then write or draw something to help them remember this attribute of God. They could write the definition for exalted or the memory verse or they could illustrate any of the passages you read about God being exalted. After a few minutes, bring the group back together and give kids time to share what they have drawn or written. Pray that the kids in the group would come to know God more and more each week through this study and that they would remember that all of us are sinners who need to be saved and that they would thank God for the gift of Jesus and the gift of salvation for all who believe in Jesus. Pray that you and the children in the room would exalt God more that anything else in your life and that God would reveal to you things that you sinfully exalt above Him. Filed Under: Isaiah, Lesson Plans, What is God Like? Bethany is a full-time homemaker who recently 'retired' from children's ministry after serving for 20 years at 4 different churches including most recently 13 years at the United Christian Church of Dubai. She is a graduate of Samford University where she studied Human Development and Family Studies (BA - 1997) and Southwestern Baptist Theological Seminary (MA in Christian Education - Children's Ministry - 2000). She loves to write materials to help children better understand the Gospel and has written for several publications and has several books in the plans in the near future. She also spends at lot of her free time writing a food blog and preparing her home for their first child who will be joining their family through adoption soon. Tony Kummer (Editor) reviewed & updated this page on : March 27, 2019 at 12:35 pm. All our content is peer reviewed by our readers, simply leave a comment on any post suggest an update.